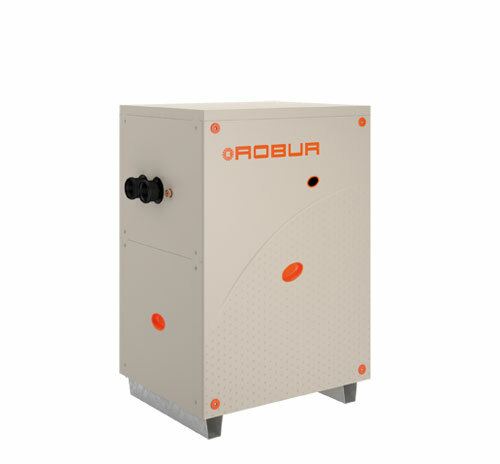 For the simultaneous heating and cooling or simultaneous production of hot water up to 65 °C and cold water up to 3 °C. For heating and cooling, the WS Series of water source gas absorption heat pumps are ideal for heating and domestic hot water (DHW) production plus pre-heating of DHW in summer in cooling operation, for example swimming pools. They can be used for new buildings as well as for refurbishment and retrofitting. When used for simultaneous production of hot and cold water, they have an overall efficiency of 244%, recovering energy from renewable energy sources. This is ideal for systems that simultaneously require heating and cooling, such as hospitals, manufacturing plants and liquid-ring-based air conditioning systems. Up to 42.6% utilisation of water source renewable energy. Designed to exceed peak efficiencies (G.U.E.) of 174%, guaranteeing reductions in annual heating costs and in CO2 emissions compared to the best condensing boilers. Simultaneous production of heating and cooling capacity, with overall efficiency of 244%. It permits a considerable promotion of the building’s energy classification with the consequent increase in the value of the building. With a GAHP-WS, every year 4.8 tons of CO2 emissions are saved, which are equivalent to those absorbed by 678 trees or those produced by 2 green cars; every year 2 TOE are saved.